"Arkanoid Decal Stickers for Romstar control Panel" (ROMSTAR). restored by Mikonos. Ready for print! I picked up these reproductions today. "Sega Rally 2 Right Side Art" printed in vinyl with gloss lamination and precut (photo 1). "Sega Rally 2 Right Side Art" printed in vinyl with gloss lamination and precut (photo 2). "Sega Rally 2 Left Side Art" printed in vinyl with gloss lamination and precut (photo 1). "Sega Rally 2 Left Side Art" printed in vinyl with gloss lamination and precut (photo 2). "Carrier Air Wing Control Panel Overlay" restored by Mikonos & Zona Arcade. "Carrier Air Wing Control Panel Overlay" comparative samples. Restored by Mikonos & Zona Arcade. "Sega Rally 2 Bezel Sticker" printed in vinyl with gloss protective lamination (photo 1). "Sega Rally 2 Bezel Sticker" printed in vinyl with gloss protective lamination (photo 2). "Outtigger Marquee" (SEGA) scanned 600 dpi and restored by Zona Arcade & Mikonos. 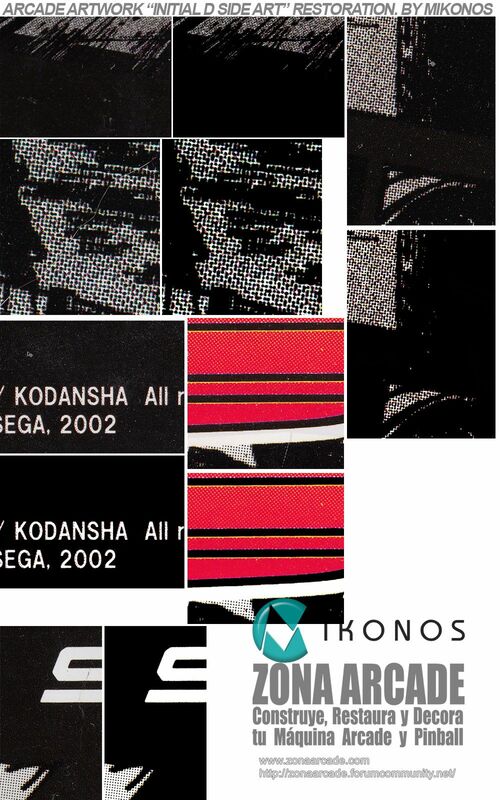 Details in "The Typing of the Dead Marquee" (SEGA) scanned 600 dpi and restored by Zona Arcade & Mikonos. "Astro City Right Side art". Real artwork scanned at 600 dpi and restored a by Mikonos & Zona Arcade. Details in "Astro City Right Side art". Real artwork scanned at 600 dpi and restored a by Mikonos & Zona Arcade. Artwork "Space Invader Bezel" (TAITO) Perfect Restoration! By Mikonos & Zona Arcade. Details in "Space Invader Taito Bezel" restoration. By Mikonos & Zona Arcade. "Dynamite Deka EX" (jp) by SEGA. Scanned at 600 dpi and restored by Mikonos & Zona Arcade. "Tail Gunner 2 Cockpit Arcade Cabinet" - Backplate restored by Mikonos & Zona Arcade. "Tail Gunner 2 Cockpit backplate" restored by Mikonos & Zona Arcade. Comparative details in "Tail Gunner 2 Cockpit backplate" restoration by Mikonos & Zona Arcade. All look great, well done! are you actually selling this re-drawn artwork, or just showing off? maybe a price list would help....??? seanr28, read my first post in this thread. "Gorf Control Panel Overlay" fixed by Mikonos & Zona Arcade. "Gorf Control Panel Overlay" some fixes by Mikonos & Zona Arcade. "Gorf Control Panel Overlay" printed in vinyl with real "Silver Mat Metal" and gloss protective lamination. 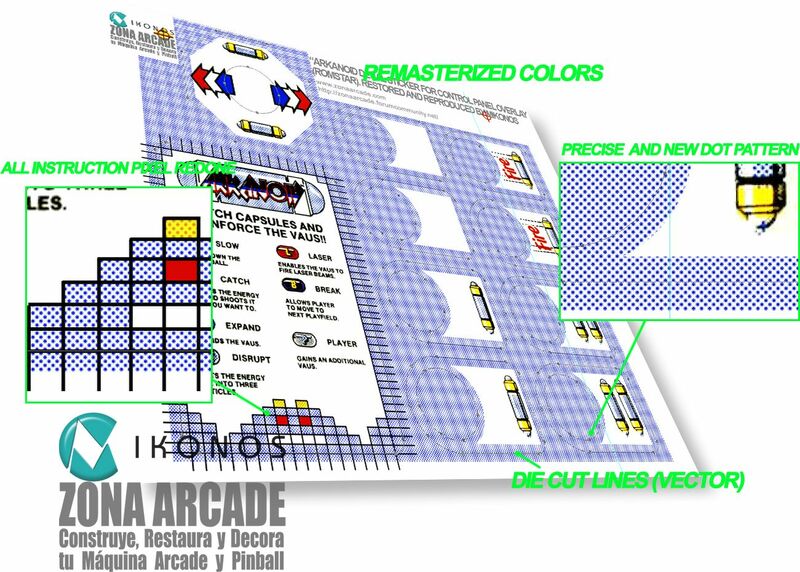 Reproduced by Mikonos for Zona Arcade webside (photo 1). "Gorf CPO" printed in vinyl with real "Silver Mat Metal" and gloss protective lamination. 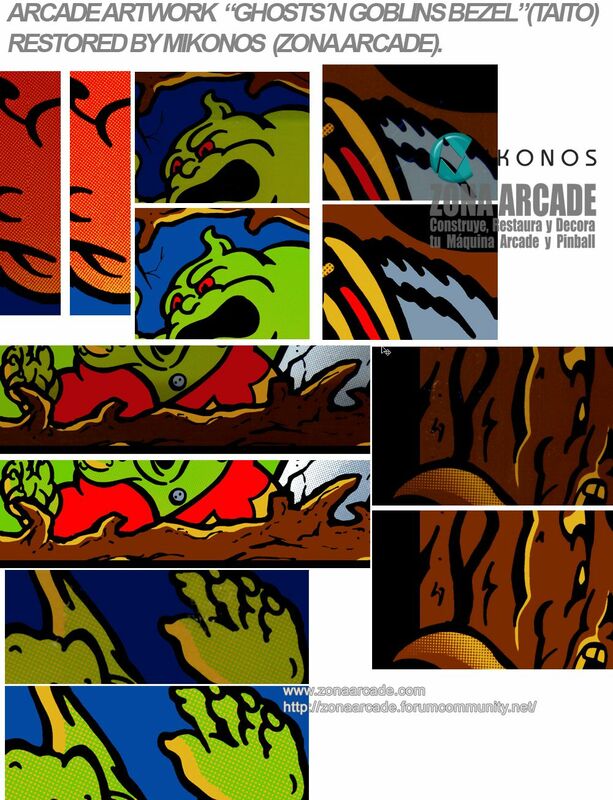 Reproduced by Mikonos for Zona Arcade webside (photo 2). Arcade artwork "Daytona Usa Side Art Right" restored from the original by Mikonos (Zona Arcade). Details in "Daytona Usa Right Side Art" (SEGA) restored by Mikonos for Zona Arcade WebSite. Dot Patter details in "Daytona Usa Side Art" (SEGA) restored from the original by SEGA. Mikonos. Original "Daytona USA Side Art" (left) restored by Mikonos for SEGA arcade cabinet. "Daytona USA Left Side Art" arcade artwork details restored by Mikonos. "Shadow Dancer Side Art" by SEGA. Restored Zona Arcade & Mikonos. Details in "Shadow Dancer Side Art" (SEGA) arcade artwork restoration. By Zona Arcade & Mikonos. "New Net City Control Panel Overlay Perfect Reproduction" printed in chrome vinyl with extra gloss protective lamination and precut (photo 1). "New Net City CPO Perfect Reproduction" printed in chrome vinyl with extra gloss protective lamination and precut (photo 2). "New Net City Control Panel Overlay Perfect Reproduction" printed in chrome vinyl with extra gloss protective lamination and precut (photo 3). Are these for sale somewhere? 1) The point of this thread is to show my restoration/reproduction work. No more, no less. Don´t ask me for printing in this thread , I´m not a shop. Use my mail or private message. Details "Before-After" in "Final Fight Side Art"Artwork Restored by Mikonos & Zona Arcade. Details Before-After in "Out Run Cabaret Bezel" (SEGA) restoration. By Mikonos & Zona Arcade. 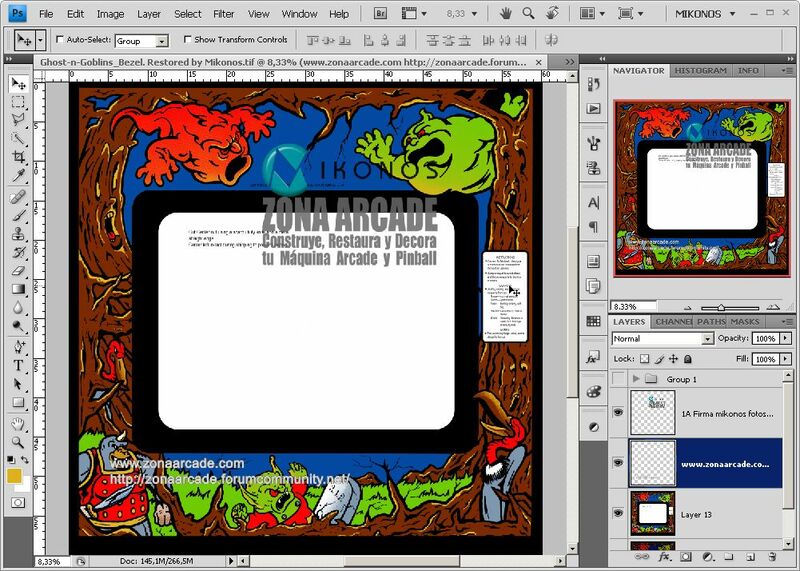 "WonderBoy Instructions Sticker" para el bezel arcade vectorizada /restauradda por Mikonos para Zona Arcade. Arcade artwork "WonderBoy Bezel Sticker" restaurado por Mikonos para el espacio Zona Arcade. "Wonder Boy Bezel Instructions" (SEGA) printed in vinyl with gloss protective lamination (photo 1). Artwork printed: "Wonder Boy Bezel Instructions" reproduction in vinyl with gloss protective lamination. (photo 2). 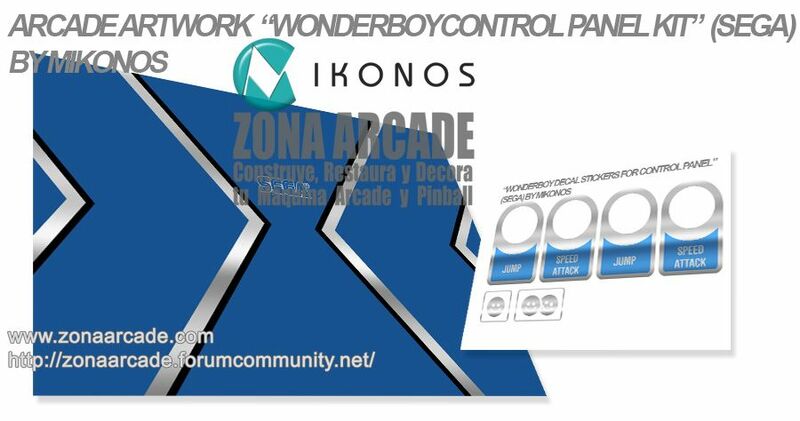 "Wonderboy Control Panel Overlay" and "Wonderboy Decal Stickers" (SEGA) reproduced by Mikonos for Zona Arcade. En esta fotografía del panel de control de "Wonderboy" podéis ver el detalle de las pegatinas de botones en plateado y de algunos elementos del fondo del panel. "Wonder Boy Start stickers for Control Panel Overlay" (SEGA) reproduction printed in silver vinyl. By Mikonos & Zona Arcade. "Wonder Boy Decal stickers for Control Panel Overlay" (SEGA). Reproduction printed in silver vinyl with gloss protective lamination. By Mikonos & Zona Arcade. "Wonder Boy Decal stickers for CPO" (SEGA). Reproduction printed in silver vinyl with gloss protective lamination. By Mikonos & Zona Arcade. "Wonderboy Marquee" (SEGA) restaurado por Mikonos para Zona Arcade. El "antes y el después" en "Wonder boy Marquee" (SEGA) restaurado. Por Mikonos. Arcade "Wonder Boy Marquee" (SEGA) printed in backlite (photo 1). "Wonder Boy Marquee" (SEGA) for arcade cabinet printed in backlite (photo 2). all looks great, but a totaly pointless thread! Pretty sure this guy got banned on Arcadeotaku forum about a year or maybe 2 ago. Basically came on saying look what I can do but wouldn't be open about what specific artwork would cost.Apparently when people did pm or email him he would be vague about the cost and hard work. seanr28, the point of this thread was explained in first post. If you need something from me, read the point 1. Artwork arcade "Ghosts´n Goblins Bezel" restaurado para Zona Arcade por Mikonos. "Ghosts´n Goblins Bezel" (TAITO) comparative restored by por Mikonos. Miniature arcade artwork SEGA "Golden Axe Marquee" restored by Mikonos. Comparative of real restoration in "Golden Axe Marquee" by Mikonos. "Joust Marquee" (Williams) arcade artwork. Restored by Zona Arcade and Mikonos. Comparative samples in "Joust Marquee (Williams) arcade artwork. Restored by Zona Arcade and Mikonos. "Tiger Heli Side Arts" printed in vinyl with gloss protective lamination (photo 1). "Tiger Heli Side Arts" printed in vinyl with gloss protective lamination (photo 2). out of interest, why don't you want to share the files to help others restore their machines. It's a shame as the arcade community has always been built around sharing to keep these things alive for as long as possible. "Tiger Heli Decal Stickers for Control Panel Overlay" printed in vinyl with gloss protective lamination and precut (photo 1). "Tiger Heli Decal Stickers for CPO" printed in vinyl with gloss protective lamination and precut (photo 2). still a pointless thread, thats just being used to show off! The King of Dragons Marquee" (Romstar) Restored by Mikonos & Zona Arcade. The King Dragons Marquee" (Romstar) restoration samples in detail. By Mikonos & Zona Arcade. "New Net City Marquee" (SEGA) scanned and Restored Zona Arcade & Mikonos. Arcade artwork details in "New Net City Marquee" (SEGA). Scanned and Restored Zona Arcade & Mikonos. I think it's a little blunt to say it's pointless. There is obviously some great work and people show off restoration all the time. If you read post 1 he does suggest that he will share artwork at his description but doesn't want businesses to make a profit from it. I can see why that would be frustrating, I have restored some marquees previously and a week later there happens to be some on eBay for sale. It's pretty gutting trying to give back to the community for someone to easily be able to make money from that work, particularly with out asking. Has anyone pm'd to see if they can have a copy of any of this work ? "Carrier Air Wing Control Panel Overlay" printed in vinyl with rough protective lamination (photo 1). "Carrier Air Wing CPO" printed in vinyl with rough protective lamination (photo 2). "The Typing of the Dead Marquee" (SEGA) scanned 600 dpi and restored by Zona Arcade & Mikonos. "Astro City Control Panel Overlay" (SEGA) scanned at 300 dpi and restored by Mikonos (Zona Arcade). 100% accuracy! Before - After in "Astro City Control Panel Overlay" (SEGA) scanned at 300 dpi and restored by Mikonos (Zona Arcade). 100% accuracy! Some great artwork here, awesome job! I've dropped you a line regarding AfterBurner art. I think it is just a resto thread. You aren't providing a service here, are you Mikonos? Yes, that is right we did. Your statement was "The point of this thread is to show my restoration/reproduction work. No more, no less. Don´t ask me for printing in this thread , I´m not a shop"
Are you willing to share the artwork files for people who might need them for their own restorations ? You PM'd me but it seems you have PM's off as it wouldnt let me reply ? My Ukvac´s PM Box is almost emtpy, you would write me in any moment, and my mail is available. "New Net City Marquee" reproduction print process in backlite with real chrome details. By Mikonos & Zona Arcade. Initial D Side Art Right" (SEGA) restored By Mikonos. Arcade Artwork details of "Initial D Side Art Right" restored. Mikonos. 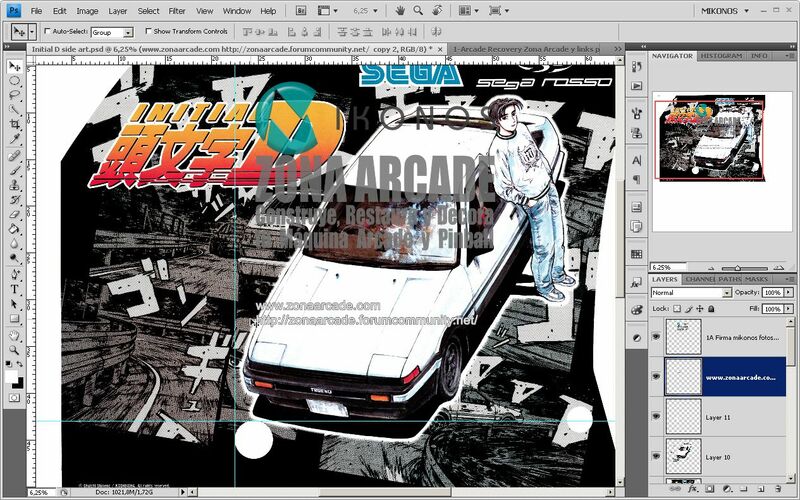 Details of "Initial D Side Art Right" restored with diecut line (vector). Mikonos. 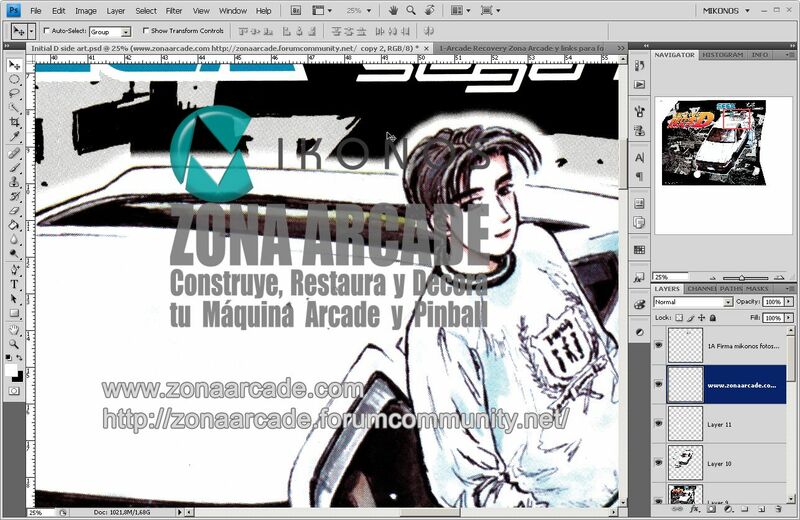 Arcade artwork "Initial D side art" (left) en proceso de restauración. Por Mikonos. Detalle arcade artwork "Initial D side art" (left) en proceso de restauración. Por Mikonos. "Initial D Side Art" (left) comparativa sampla a sample del antes y el después. Por Mikonos. Some excellent work here and serious dedication. Thanks for sharing Mikonos. To be clear to other members - this is the 'Artwork & Restorations' section of the forum, for people to show artwork that they've restored, as well as other aspects of the cab restoration process. This is exactly the right section for Mikonos to show his work and these posts are using this section of the forum as intended It is not a For Sale thread, so there are no prices. some nice work there, them new net city decals look awesome, could you do the same for the Naomi cab side decals? the bit that says "universal cabinet"
I did them many time. It was not a difficult repro work. ... and I did customized "Naomi Universal Cabinet Side Arts" too. 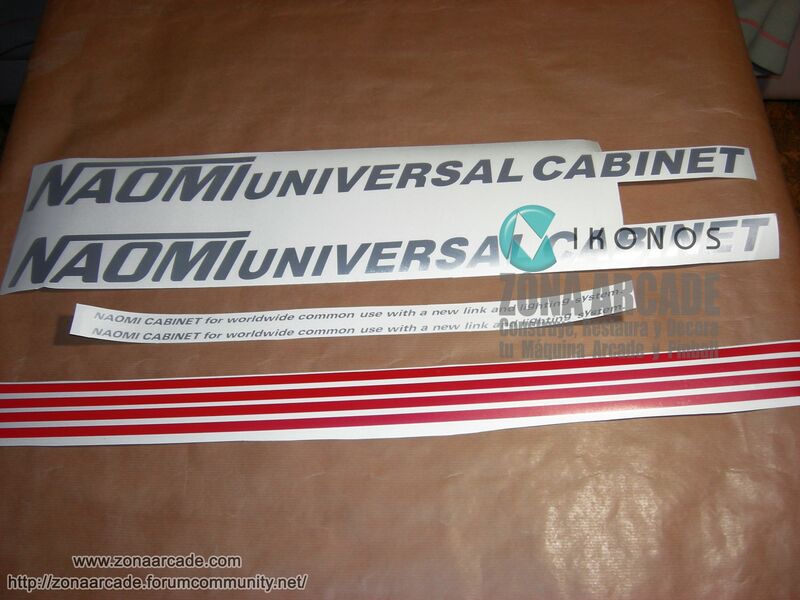 Kits para decorar los side arts "Naomi Universal Cabinet" realizados por Mikonos y ?t=27993967" rel="nofollow - "<b> - ART</b>” para Zona Arcade. Sample de transportador transparente/translúcido. 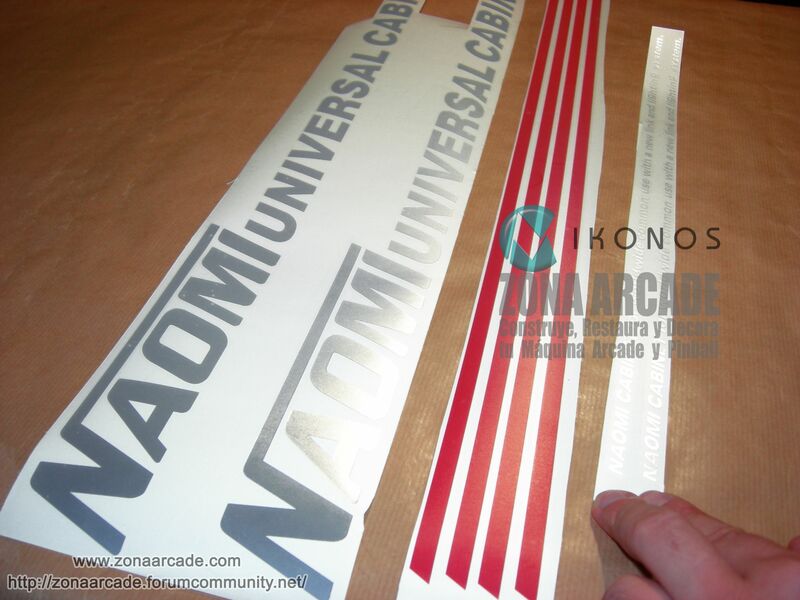 Kits limpios y transportados "Naomi Universal Cabinet" para la máquina recreattiva arcade de REPROART y Mikonos para Zona Arcade (foto 1). Kits limpios y transportados "Naomi Universal Cabinet" para la máquina recreattiva arcade de REPROART y Mikonos para Zona Arcade (foto 2). "Net City Instruction Space" (SEGA). Original generic arcade artwork for Net City Cabinet. Restored Mikonos & Zona Arcade. "Guerrilla War Side Arts" (SNK) arcade artwork restored by Mikonos. Comparative samples in "Guerrilla War Side Arts" (SNK) arcade artwork restored by Mikonos. "Cadillacs and Dinosaurs Marquee" (CAPCOM) restored by Mikonos & Zona Arcade". Details in "Cadillacs and Dinosaurs Marquee" (CAPCOM) restored by Mikonos & Zona Arcade". "Virtua Fighter 4 Final Tuned Marquee" (SEGA) for Candy Cab, scanned at 600 dpi and restored by Mikonos y Zona Arcade. Details in "Virtua Fighter 4 Final Tuned Marquee" (SEGA) for Candy Cab, scanned at 600 dpi and restored by Mikonos y Zona Arcade. Arte artwork "Sega Rally 2 Change Rear Decal Sticker" (deluxe version). Restored by Mikonos. "Sega Rally 2 Change Rear Decal" reproduced in vinyl with gloss protective lamination, precut and metal details (photo 1). "Sega Rally 2 Change Rear Decal" reproduced in vinyl with gloss protective lamination, precut and metal details (photo 2). "Sega Rally 2 Change Rear Decal" reproduction process with metal details. By Mikonos & Zona Arcade. No he did not want to mix business with his work. You could say he is a true artist? BTW. Mikonos, it looks AWESOME ! If you need my help, read point one in first post. Other questions in point four. Read it please! Artwork arcade restaurado "Rygar Marquee" (Tecmo). By Mikonos. 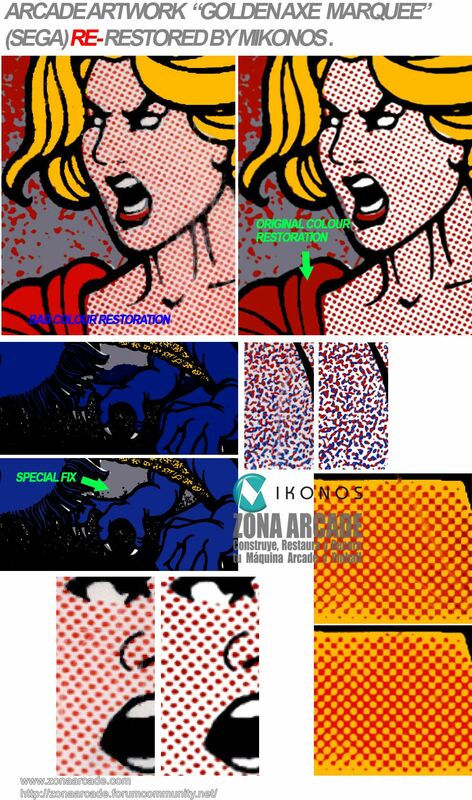 Comparative samples "Rygar Marquee" restoration by Mikonos and Zona Arcade. 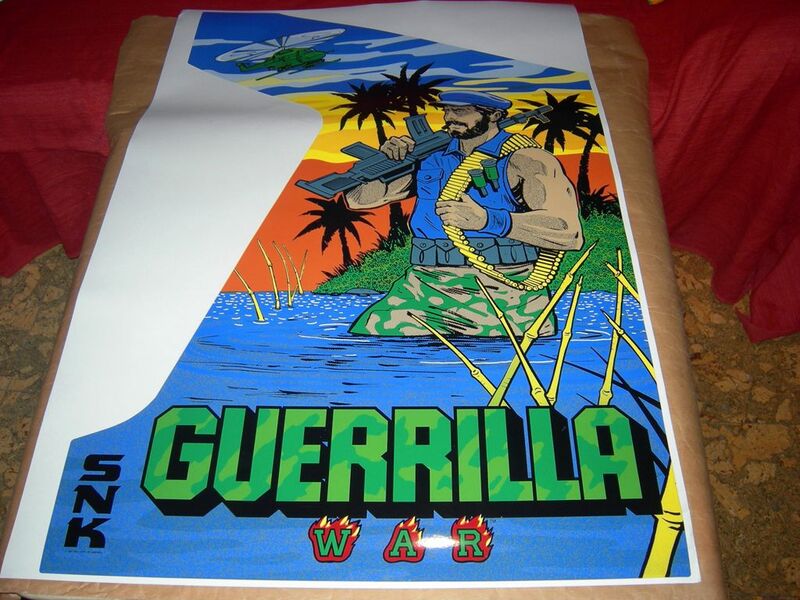 "Guerrilla War Side Art right" printed in vinyl with rough lamination and die cut. Restored by Mikonos (photo 1). 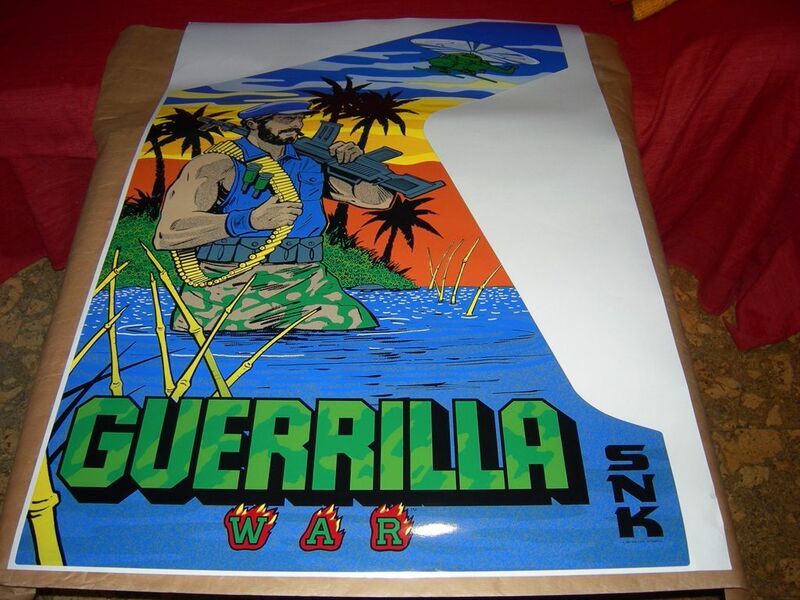 "Guerrilla War Side Art right" printed in vinyl with rough lamination and die cut. Restored by Mikonos (photo 2). 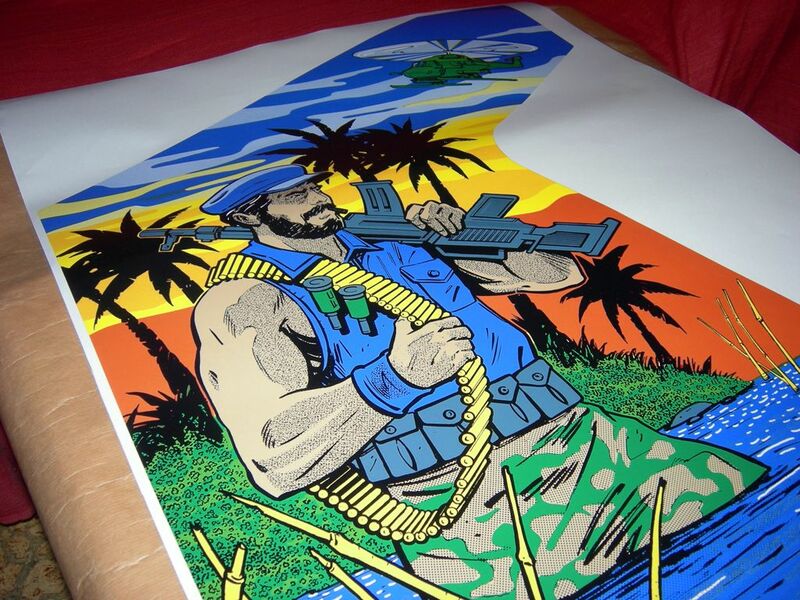 "Guerrilla War Side Art left" printed in vinyl with rough lamination and die cut. Restored by Mikonos (photo 1). 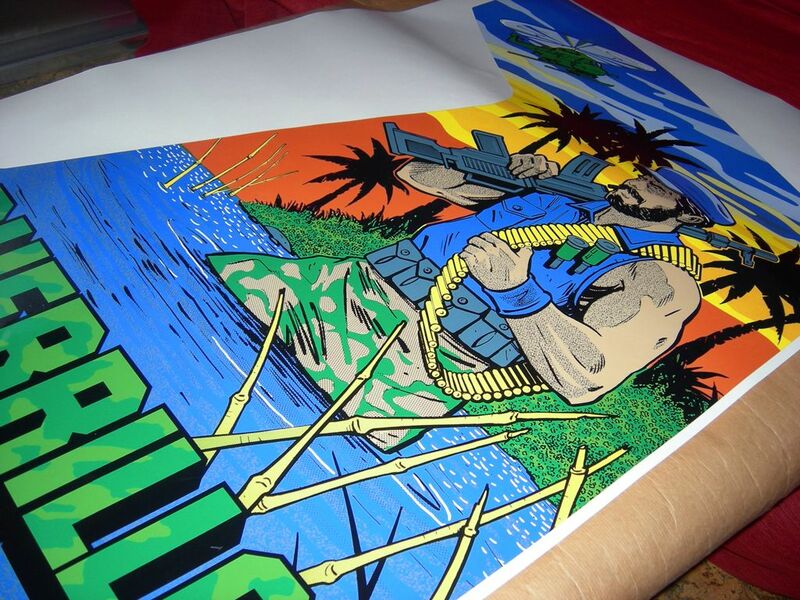 "Guerrilla War Side Art left" printed in vinyl with rough lamination and die cut. Restored by Mikonos (photo 2). What exactly does 'metal ink' mean? "Daytona USA Dashboard Sticker" (SEGA). Restored Mikonos & Zona arcade. Before-After in "Daytona USA Dashboard Sticker" (SEGA). Restored Mikonos & Zona arcade. You use photoshop? So it's not vector? I use both. I work with bitmap image and vector. Daytona Usa Dashboard, for example: I did white contour in "VR" word in vetor, but VR inside black letters are originals. I use vectors to trace die cut lines in works with precut too. Vector destroy the original handmade´s author. Vector is the last resort for me. "Net City Instruction Space Sheet" (SEGA) repro printed in paper, like original (photo 1). "Net City Instruction Space Sheet" (SEGA) repro printed in paper, like original (photo 2). "Virtua Golf Instruction Sheet" (Spanish) scanned and restored by Mikonos & Zona Arcade. Details in "Virtua Golf Instruction Sheet" (Spanish) scanned and restored by Mikonos & Zona Arcade. “Sega Rally 2 Upper Stickers - Q8 Oils, Michelin & Castrol Logos”. Restored by Mikonos & Zona Arcade. "Sega Rally 2 Upper Logo Stickers: Castrol, Michelin and Q8 Oils" printed in vinyl with gloss protective lamination (photo 1). "Sega Rally 2 Upper Logo Stickers: Castrol, Michelin and Q8 Oils" printed in vinyl with gloss protective lamination (photo 2).